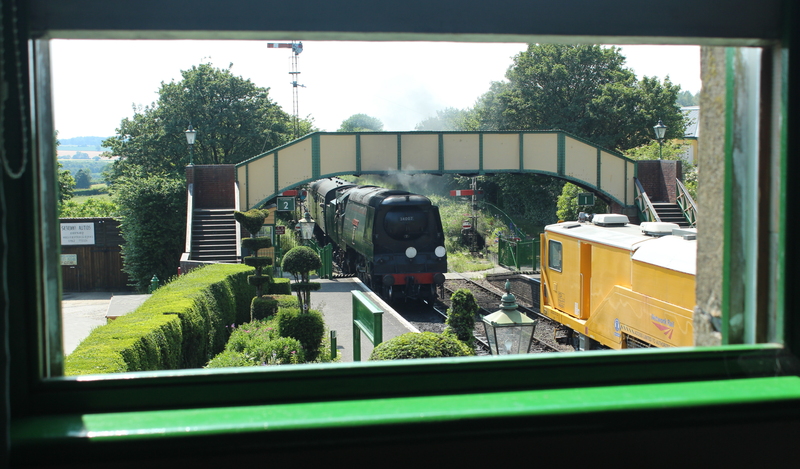 It has been an incredible first week at the Watercress Line. Fellow members of staff and the volunteers have all been very welcoming, which of course has helped make it all the better. And the view from the office is easily the best I’ve ever had (yes even with a Network Rail Stoneblower sitting there.) With that being said, in my opinion it’ll be even better once 35005 Canadian Pacific is running up and down the railway… My first professional encounter with CanPac ; the locomotive that will be the focus of my endeavours in the next few years, was on my first day moments after the frames had been separated from the driving wheels. It was the first of three visits to Eastleigh. I returned to spend some time to begin to get to know some of the volunteers working on CanPac in Eastleigh. After all, the volunteers are the heroes who will make this overhaul of one of Bulleid’s finest possible. It also gave me an insight into the work being carried out and naturally I will spending much time at the locomotive’s former birthplace. To read more about progress on Canadian Pacific, please read my first blog post written on the Watercress Line’s website by clicking here or on the image above. Finally I’d like to ask all locoyard readers to not forget to vote for the Watercress Line in the National Lottery awards – click here to read more. ← UK Heritage Hub Issue 56 ready to download!